New Strategy Game by the "Battle Worlds: Kronos" Developer! Iron Harvest, our upcoming real-time strategy game currently on Kickstarter, has been funded in less than 36 hours! The Kickstarter for our new game is online! "The Dwarves" is a fantasy RPG based on the novel with of same name. The iOS & Android versions of Battle Worlds: Kronos are finally available in the App-Store and Google Play Store respectively. Wo-hoo! iOS & Android versions this Thursday! It has been a while, but finally the iOS & Android versions of Battle Worlds: Kronos are ready for release! iOS, Android, Browser & OUYA Beta! Update 1.2.1: Better UI & Performance! The Book of Unwritten Tales 2 Kickstarter! From now on players can upload their own maps from the editor to our server, play maps created by others and rate them! Fixed a bug where the menu would remain unresponsive for several seconds after starting the game. How, where and when do I get my version of Battle Worlds: Kronos? The game will be released next Monday, November 4th, around 3 o’clock in the afternoon CET (that’s 9 o’clock in the morning EST). Second and last update for Beta 1! Next Update for the Closed Beta 1! Closed Beta 1 is here! If you backed the project with $20 or more, you’re entitled to play the beta. Battle Worlds: Kronos Alpha 1 has been released! On Friday we sent out the survey emails (Subject: "Battle Worlds: Kronos - Kickstarter Survey"). About 2/3 of you have already answered! Including Paypal we’ve reached our second stretch goal tonight (CET)! This means Battle Worlds: Kronos will be on iOS and Android Tablets and on OUYA! Oh-yeah! Breaking News: We’ve been greenlit! Two additional languages: The results are in! Today we’re half way through our campaign and we already reached our first Stretch Goal. Hooray! Steam Greenlight & Second Academy Video! 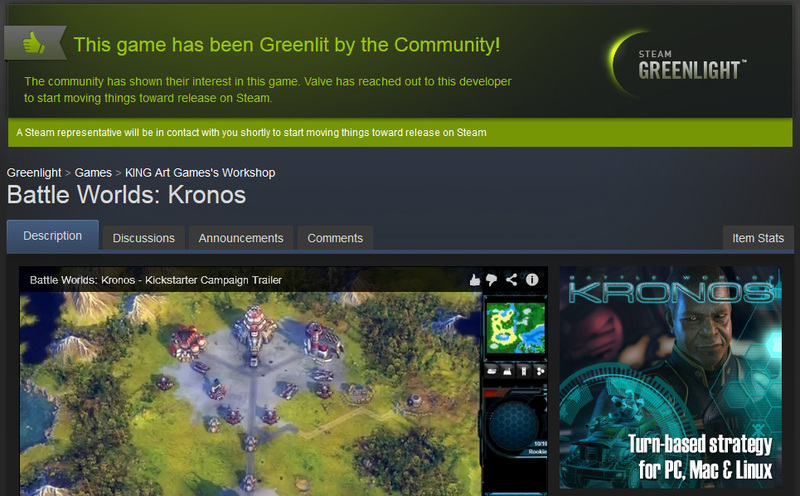 Battle Worlds: Kronos on Steam Greenlight! We did it! New Trailer! Paypal! You did it! We reached our funding goal! Stretch-Goals & New reward tiers! WOW! What a first 24 hours we had! In only 24 hours, we reached 1.000 backers and over 30% of our goal!